The United States soccer federation has reportedly talked to former Germany national team star and 2006 World Cup head coach Juergen Klinsmann recently and the German former footballer is apparently interested in the potential coaching vacancy. And it is fitting this story would come out now that Bob Bradley has met with the soccer federation earlier this week to discuss his own future with the organization. Bradley of course is interested in fulfilling the coaching vacancy that is currently available at Premier League side Aston Villa and the coach’s contract is set to run out this December. And Klinsmann has already turned down the job one previous time for the 2006 World Cup and that tournament Klinsmann coached his own nation into the semifinals and left the tournament disappointed that he could not hoist the Cup for his hosting nation. 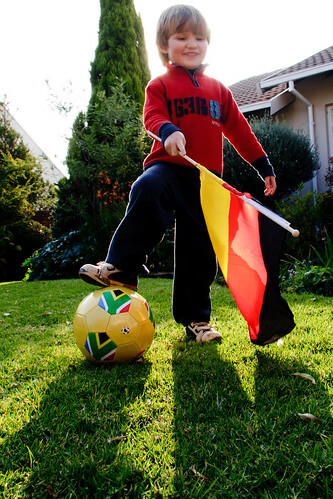 I hate to stereotype, but Germans are good at soccer and have great success at one particular global tournament. Having Klinnsman would guarantee entry to the event and a second round berth at the least. Well at least that is what is expected in the Land of Kraut. In 1990 Germany hoisted the World Cup trophy and a big reason why was because of their beloved Californian Klinsmann. Having a former winning footballer take the reigns isn’t the worst idea. As long as his name isn’t Diego Maradona. Klinsmann is not insane and has never considered streaking through the streets of Hamburg naked. In fact the guy is pretty mild-mannered on TV and doesn’t seem to be as hilarious as the famous little one is. It’s a drop in the bucket. Klinsmann lives in Cali and enjoys living here in the States. So why not use our best available resource of football success on the highest level? Klinsmann coached Bayern Munich for a season before becoming the national team coach. If he truly aspired to do that again then he would be there now. Instead he appears to be biding his time for the US national team job and he knows all about making it to the semifinals of the World Cup final and of course winning it too. Several of the German national team’s best players are actually Polish by birth-right. Perhaps Klinsmann could help us recruit a few bubble people that could gain Yank citzenship. It seems to work for the Germans and we could use the Rossi’s of the world on our side. Seriously Buddle, Findley, Ching, or old Klinsmann? It’s a tough call, but one has a few more career goals.